June 6, 1944 remembered to this day as D-Day. The invasion of mainland Europe by the Allies. It all started at 00:16 hrs on that overcast day. This is when Glider 1 of the Ox and Bucks landed a few hundred yards away from their objective. A bride on the Caen Canal. One of, if not, the most important objective to take that morning. The pilots of Glider 1 became the first men to put foot on mainland Europe in the effort to end the war. They were both unconscious as they were ejected from the glider when it landed. They were still the first “boots on the ground” ‘tho. 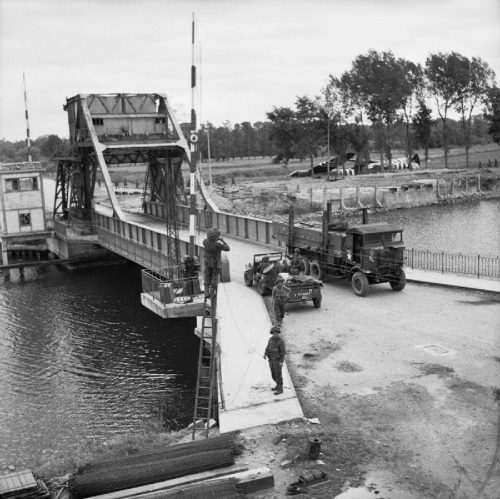 After a brief battle, the bridge was taken and the area was secured. Securing the right flank of the invasion beaches and limiting the German counter-attack. That was the start of the fighting to liberate Europe from the Nazi tyranny. As well as the last you will hear about the fighting that day. 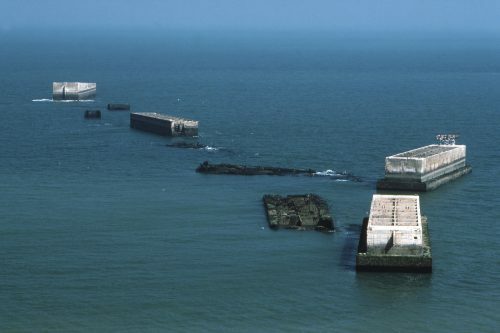 The first ships to sail to France to help the liberation were towing strange structures. Large, floating, concrete blocks and other strange things. Nobody knew what these strange structures were. We know now that these were the building blocks to one of the greatest engineering feats of the whole war. The floating harbours of Arromanches, Gold Beach, and Omaha Beach. The ships that were towing these components set off on D-Day -2 to get there in time to be constructed and running with the least time between the invasion and getting large numbers of supplies to where it was needed as Cherbourg, the nearest large port, was still quite a while off being liberated. The whole floating harbour project was almost destroyed on June 19 in one of the strongest storms to hit the English channel for many years. Mulberry “A” at Omaha Beach was destroyed but the one at Arromanches survived. It survived mainly because it was built by The British Royal Engineers who followed the plan to the letter and not cutting corners. It was only designed to survive 90 days but went on to be used for 8 months. Almost three times its design life. Not only that, the size of these harbours were comparable to that of Dover Harbour. A huge area. What these harbours did was amazing. Just down to the amount of men and material that were landed. 500,000 vehicles. From Jeeps to tanks and everything in-between. If you visit Arromanches today you can still see the remnants of the harbour still in place 70 years later. Not only that, go around the area and see how much of the harbour has been “re purposed” by the local population. From repairing destroyed bridges to fencing. The other great engineering feat of the invasion was a simple idea. As it name suggests it was simple but crazy at the same time. Operation PLUTO. Pipe-Lines Under The Ocean. 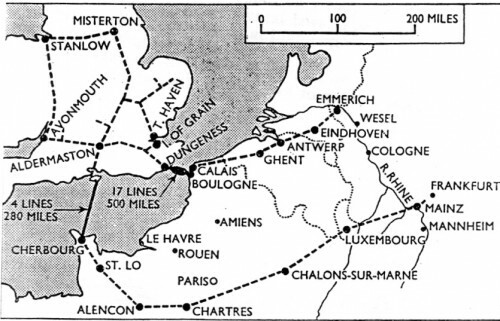 The plan was to run a pipeline from England to the invasion beaches, and onwards. Preventing the weather effecting supplies of fuel so keeping the invasion on track. It went all the way from Dungeness to the Rhine. A thousand miles. It was a huge success. The whole network of pipes eventually pumped 172 million gallons of fuel. It was moving as fast as the invasion. Trying to keep up with the vehicles so as little time as possible would be lost to “retreating” to get fuel. At the end of the war, the pipeline was recovered and sent to be recycled. Sorry, scrapped.